Really Big Taps up to 4"/ 100mm in all pitches fine & coarse generally available in 3-5 days and especially Made to order [in Australia]. 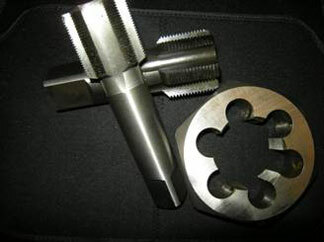 Includes Pipe Taps (BSP, BSPT, NPT, etc.,) to 3" and STI or thread inserts. Note: Tap availability depends on raw materials / tap drawings to hand. TIME-SERT® FOR PERFECT REPAIR OF DAMAGED OR STRIPPED THREADS. The Timesert system is based on solid thin wall inserts – withstands high stress vibration, frequent tightening cycles. TIME-SERT® is very thin due to synchronized internal and external threads. Less stock removal. TIME-SERT® is pressure sealed upon installation. Liquids & compressed gases will not flow around the insert. TIME-SERT® is self-positioning. Having a flange it cannot wind down into the newly repaired hole. TIME-SERT® is self locking. On installation the bushing will not come out with screw / bolt. 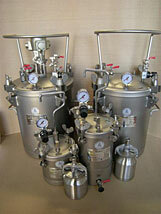 Certain sizes are available in Stainless Steel – suitable for corrosive environment or food equipment. Applications: Stud bolt threads, High load bearing applications, head bolts, diff stud bolts, spark-plug threads. Suits Following Materials: Aluminum, Cast iron, Steel, Brass etc,. Available in different materials: SS for corrosive areas, Copper plated for sparkplug applications for better heat transfer. Used by O.E.M’s to strengthen/reinforce threads in new products and of course repair of damaged threads. Flex-Hone Surface Finishing Tools are predominantly used for plateau finishing or de-glazing engine bores. Other uses include rust removal, blending in, de-burring. These tools provide those benefits without any real stock removal, are self compensating for wear, extremely easy to use and are virtually unbreakable. Typically we stock these sizes in 180, 240 and even 400Grit in the larger sizes. Material is Silicon Carbide. Sizes up to 8 inch [203mm] are generally available ex stock. Note: When ordering advise bore size as these are 10% oversize to allow for side wall pressure in application. What RPM do I use? How do I know what grit size I have? The rpm will vary with the size of the tool and will range from 1200-60 RPM. 3" - 700 RPM. For a 6" tool nearer to 450 RPM and so on. The grit is identified by a coloured marking on the tip. i.e. tool. We are reducing the rough peaks of a surfaces microstructure and typically remove a small amount of material. Because the tool needs to be slightly oversized to function properly. GBD is extra heavy duty type. GBD series Cored from 8 1/2" thru 18" feature a steel hex drive shaft that is 34" OAL. Flexhones go up to 32"